good one..never think of tomato chapathi.will try it . 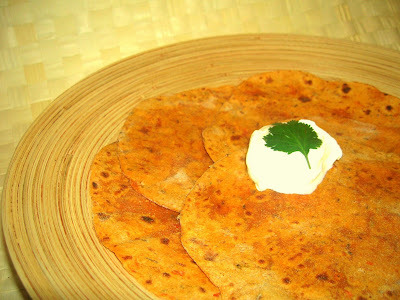 I almost made these Tomato chapatis after making beet and Avacado rotis! !I think Seema had made these few weeks ago. hey nice entry yarr!! looks so colorfull and tempting to eat. Wonderful entry for the event pa..
Swapna: Sure, its very good recipe to try. Asha: Thanks and will check Seema's blog and try her version. 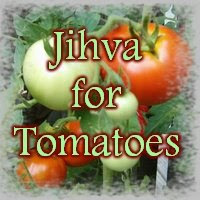 Usha: Thanks Usha and I am looking forward to the roundup of amazing delights with tomatoes. 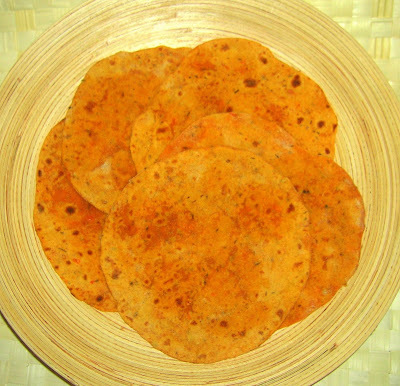 Mythreyee, the chapatis look delicious and colorful. Great entry for JFI. Thanks for sharing. Great Entry for JFI. Good one .will surely try this one too . I am actully new to this blog .Inspired by you guys who are doing such a great job i am also in the process of starting a blog . Just started of a few things to begin with .My blogs name is http://recipesnmore.blogspot.com/.I have not fully constructed it .but will soon upload more of my recipes .I am doing a radio prgm which is online tamil radio. 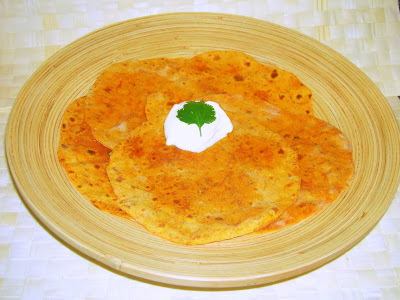 Ur tomato chapathi is very nice. I have heard of tomato poris but first time i am seeing tomato chapathis, Its very nice. Visited your site and it looks good. Sukanya: Thanks for dropping by. Try and let me know if you liked it. Thanks. thanks for trying. I am happy you liked it. Im adding this recipe to my bog as well..